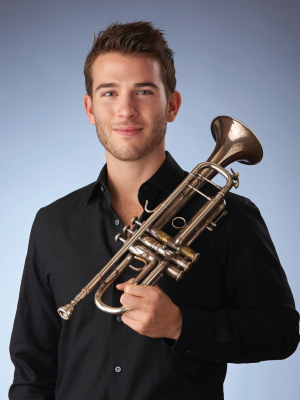 Conrad Jones is the newly appointed principal trumpet of the Indianapolis Symphony Orchestra. Prior to this position, he served as principal trumpet of the Tucson Symphony Orchestra. During the summer season, he is principal trumpet of the Britt Festival Orchestra in Jacksonville, OR, under Music Director Teddy Abrams. A native of Long Island, NY, he received his Bachelor’s of Music in trumpet performance at the Cleveland Institute of Music before continuing onto the Professional Studies program at the Colburn School Conservatory of Music in Los Angeles, California. Mr. Jones has been a featured soloist with the Downey Symphony Orchestra, the Colburn Orchestra, the Cleveland Institute of Music Orchestra and the Tucson Pops! Orchestra. He made his solo debut with the TSO during the 14–15 season, performing George Tsontakis’ True Colors: Concerto for Trumpet and Orchestra. An avid chamber musician, Jones has performed with various new music ensembles, including LA based WildUp!, Cleveland based FiveOne, and Cantori Domino. Jones is a founding member of the Kyōdai Brass Quintet, a group started in Cleveland with his two younger brothers in 2009. Praised for their innovative and engaging programs, Kyōdai’s most recent activity includes residencies with the Detroit Chamber Music Society and the Cleveland Chamber Music Society. They were awarded the Aspen Music Festival Brass Quintet Fellowship in 2013. Outside of Indianapolis, Jones has performed as guest principal trumpet with the Detroit Symphony, Phoenix Symphony, Malaysian Philharmonic and CityMusic Cleveland. He was acting 2nd trumpet with the San Francisco Ballet Orchestra during the 15–16 season. Former teachers include Michael Miller, Michael Sachs, and Jim Wilt.